Women’s Hair and the question of Gray? There comes a time in every woman’s life when she is faced with this decision and for some of us it’s not an easy one. 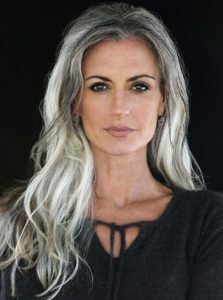 For some women, gray hair has always held a special significance like a of a rite of passage from youth into the stigma of old age. Yet, going gray doesn’t have to be such a dramatic plunge. You may be able to ease into this inevitable transition with a keen strategy, a willingness to accept change and a talented stylist as your companion. I asked Jim O’Keefe, Owner and Founder of At the Top Gallery/Salon to discuss this topic and here’s what he had to say about going Gray. When is the best time to go Gray? Women do fear showing their age. However, there comes a point when coloring your hair can make you older, because of skin color. For example people who have yellow in their skin tone don’t do well with yellow highlights. So gray can actually revitalize your skin tone to a more pink or peaches and cream complexion. What is the best method to ease in the grey? Start with growing out a streak preferably around the face or the part line, which will help detract from the grow out and pull the attention towards the two longs streaks. Do you add color and just let all color go? NO, don’t let all the color go at once. Continue to add some color and you can always use low or highlights to break up the line of growth. The idea is to blend. For some people they can add blonde if your skin tone has pink undertones, but if you have yellow undertones avoid the blonde. What kind of hair products are best for Gray hair? BLNDN is a blue based shampoo which take the yellowing out of your hair and the red out of fading color. This product was developed by 2 female chemists. Young people are even dyeing their hair gray! 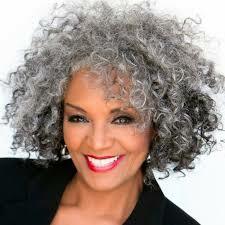 So if you do choose to let your hair go gray you may evne be considered trendy. There are some bold celebrities who have even celebrated the discovery of gray. Chrissy Teigen not only aknowledged the inevitable march of the grays, she embraced it with humor and style. Humor is as helpful as a good stylist in facing one of life’s transitions.